We all want to make wise decisions, especially when it comes to buying a house. I mean, this is going to be one of the biggest purchases you’ll ever make and you certainly don’t want any regrets. 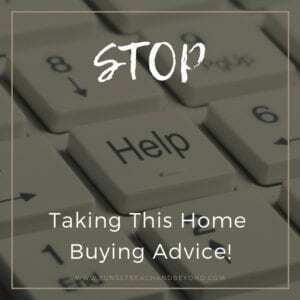 While there are a lot of things you’ll want to follow when it comes to buying a house, there is some bad advice out there as well. Listen up for some of the worst advice we’ve ever heard given to homebuyers. Even if you think you will buy the house regardless of the results, a home inspection is a crucial point to the process. We’ve had people tell our buyers, “oh don’t worry about the home inspection, especially if you love the house, it doesn’t matter what’s wrong with it.” And that’s simply not true. You could be in a world of hurt and a mountain of debt if the home inspection reveals something that could’ve saved you all of that money. Always spend the extra few hundred dollars and get a professional home inspection. You never know what is going to turn up, and even if you’re satisfied with the results, at least you understand more about your investment. You should always make a lowball offer. We’ve heard buyers say that no one should ever make a full price offer, regardless of the market. And that’s fine if you want to lose the house. It really comes down to the type of housing market we’re in. If it’s a seller’s market, a lowball offer or even an offer under asking price is likely to get thrown out right away. Unless it’s a buyer’s market where sellers are motivated to sell as quickly as possible, a lowball offer will probably get rejected. It’s important to trust your real estate agent when it comes to the right offer price. You can get into the house before closing. Let me make this extremely clear, I cannot give you the keys until the deal closes. Sellers may allow you to get back into the house before closing for measurements, final walk-throughs, and home inspections, but other than that, they really don’t need to let you in for any legal reason and you absolutely cannot get into the house until the deed records in the county. It is not your house and you would technically be breaking and entering if you’ve got into the house prior to closing without your agent or permission. On the opposite side, letting a seller stay in the house past the closing date could open yourself up to a world of problems. The closing date needs to be the end-all, be-all when it comes to ownership. The listing agent can also help you buy the house. Now, while this is legal, it’s not ethical. This is why we have buyers agents and selling agents both in the same office. We feel that there needs to be two different agents working on the same transaction so that each party is represented properly and with fiduciary duty. A buyers agent should represent the buyer in a transaction and the listing agent should only represent the seller. 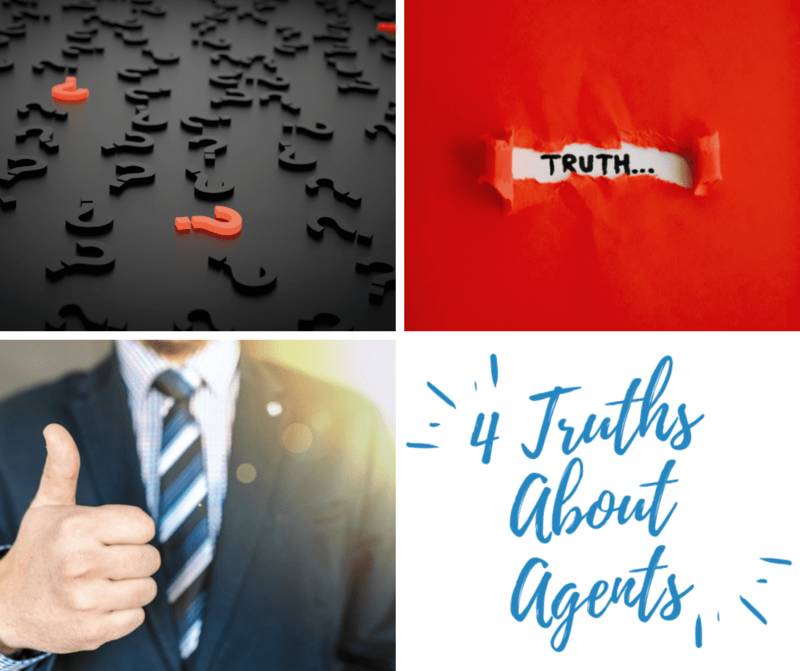 Having the same agent do both sides of the transaction, also called dual agency, is really a conflict of interest and it comes down to who the agent is really working for. We want you to buy a house without any regrets so these are some of the top issues we see, especially with first-time homebuyers. We want you to be happy with your purchase, have no regrets, and fill confident and satisfied long after the deal closes. We want our clients, whether it’s a buyer or a seller, to be well informed about the home buying and selling process and that sometimes means being honest about real estate agents. Not all agents are ethical, shocker! But by weeding out to those that might have unethical practices, we can help you be more informed and better able to make a wise decision when it comes to selling and buying and who to represent you. With that in mind, here are four things you should probably know about real estate agents before buying or selling. Real estate agents can work both sides of the transaction. This means that the same real estate agent can assess the buyer and the seller in the same transaction. Typically, the buyers have their own representation and the sellers have their own listing representation but dual agency is allowed in most states and this is where the same real estate agent can represent both the buyer and the seller. You can probably already start to see the discrepancies and conflicts of interest that this can create. If an agent is representing a buyer and a seller, how can they hold up to their fiduciary duty and be honest both sides? Confidentiality can be skewed when it comes to representing both sides. If a buyer is trying to negotiate for a lower price but the seller knows that the buyer can afford more, chances are that buyer is getting the short end of the stick. Similarly, if the seller can come way down on the price and the buyer knows it, they’re going to keep negotiating for that lower price. You can see how this can be a huge conflict. It’s best to have your own agent representing you, regardless of which side you are on. Most listing agents will tell you a flat 6% commission but it is negotiable. However, that 6% is split in half between the buyer’s agent and the seller’s agent. For higher-priced homes, there is a pricing strategy that can be used but when negotiating, just remember that you can always negotiate for a lower or a different type of split to be more attractive to buyers agents, drawing in more buyers. Open houses may not work. Sellers expect open houses but they usually don’t necessarily sell the house. Statistics show us that only 7% of buyers find their home at an open house. Often times, agents will sit open houses simply to gain more buyers, rather than to actually sell the house. When it comes to an open house, it’s truly up to the homeowner whether they choose to have an open house or not. There’s always the security aspect so think carefully before deciding on an open house. Read More: Is it okay to find a Realtor® at an open house? You are free to choose your own service provider. 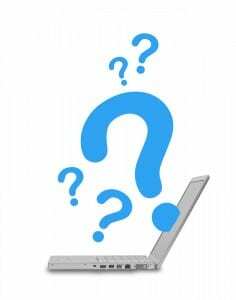 Because we work with both buyers and sellers (because we have listing agents) we have a plethora of resources such as home inspectors, real estate attorneys, escrow and title companies, but you have the ultimate choice on who to use. One little piece of advice when it comes to service providers, experienced, long-term agents have usually built up a better book of referrals and resources the new agents. Because we have sold real estate for decades, we have found excellent service providers that are reputable, honorable, and affordable. The point is to choose your real estate agent carefully. We have listing agents and we are buyers agents so even though we are on the same team are loyalty lies to one side or the other during a transaction. Feel free to interview us, ask questions, and contact us when you’re ready to buy or sell throughout Brunswick County in both North and South Carolina. Many homebuyers don’t realize that they pay a buyer’s agent nothing to use their services. So, it begs the question: how does a buyer’s agent get paid? A buyer’s agent works strictly with a homebuyer helping them negotiate for their terms, find the right home for their needs and their budget and need a mediator between the buyer and seller. The buyer’s agent is a licensed real estate agent for their area and can facilitate a real estate transaction on the buyer’s behalf. It is vital for buyers to have their own representation when conducting a real estate transaction. If the buyer chose to utilize the services of the listing agent when purchasing property, their best interest may not be considered since the listing agent’s primary job is to sell that particular house for the seller. A buyer’s agent’s primary job is to work exclusively with the buyer without any hidden agenda on selling one particular property over another. However, this brings up the interesting topic of how agents get paid. Regardless of which home the buyer chooses, the buyer’s agent will receive half of the commission that was originally agreed upon between the listing agent and the seller. For instance: let’s say the sellers of a particular property enlist the help of a listing agent. That agent writes up the contract with a pre-negotiated set of agreements such as the commission, listing price etc. The commission can be negotiated but is typically between 6 and 7% of the sale of the property. This percentage is then split between the listing agent and whoever brings the buyer, typically the buyer’s agent. This percentage of the commission can be split equally or it can be split unequally depending on the type of negotiations. Sometimes listing agents will decrease the listing agent commission to boost more buyer’s agents to bring in a buyer or because they are also helping the seller purchase another home in which case they would receive the buyer’s agent’s commission on another deal. But, make no mistake, a buyer’s agent’s total responsibility is first to their buyer and not to the seller. Even though the seller will pay the commission to both agents, the buyer’s agent is still working exclusively for the buyer. Regardless of which home the buyer chooses, that agent will get paid off of the sale of the home. Buyer’s agents are responsible for negotiating their own commissions so it’s not something that the buyer ever needs to worry about. 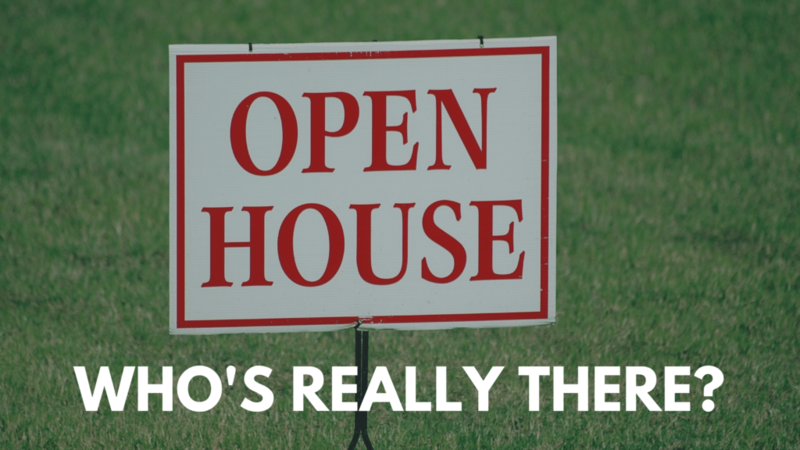 Is it Okay to Find a Realtor at an Open House? Open houses, even though they may not actually sell the house, are still a necessity and something that most sellers require and expect of their agent. They can be a great marketing tool and something that homebuyers can view or tour while looking at homes. But there’s something we want to inform all of our buyers about, the agent that usually suits the open house may not be the agent selling the property, but actually using this is an opportunity to get more buyers. Let me show you what I mean. When an agent lists the house they may or may not be the one actually attending the open house. They may enlist the help of a buyers agent to set the open house and collect any new buyers that might come along that don’t already have their own agent. Listing agents similarly can sit the open house, not necessarily to sell the house, but to find new clientele themselves. One thing we want to inform all of our buyers or potential buyers about is that the listing agent that is sitting the open house may not have your best interest at heart. Remember, their main goal is to sell this house. Can you imagine what the homeowners would think if the listing agent obtained a new buyer during the open house and they didn’t buy their house? I know that it happens a lot, but we want to be very transparent with our buyers and let them know that it’s extremely important to have your own representation before touring houses. This is really the caution I want all potential buyers to have. Don’t just be wrapped up in some fancy agents speech at an open house. You need to find representation that works for you first, not for the sale of any one particular property. Because we primarily deal with buyers, know how to represent them the best, and make sure they are protected throughout the transaction. We help our buyers find the right home, not just sell one particular property. So, as the final word of warning, when touring open houses, be cautious of the sales pitch. They will usually ask you right away if you’re already working with a buyers agent. It’s important to have that relationship nailed down so you can competently say that you are, and then enjoy touring the rest of the house in peace. What if I Have Buyer’s Remorse After a Real Estate Purchase? 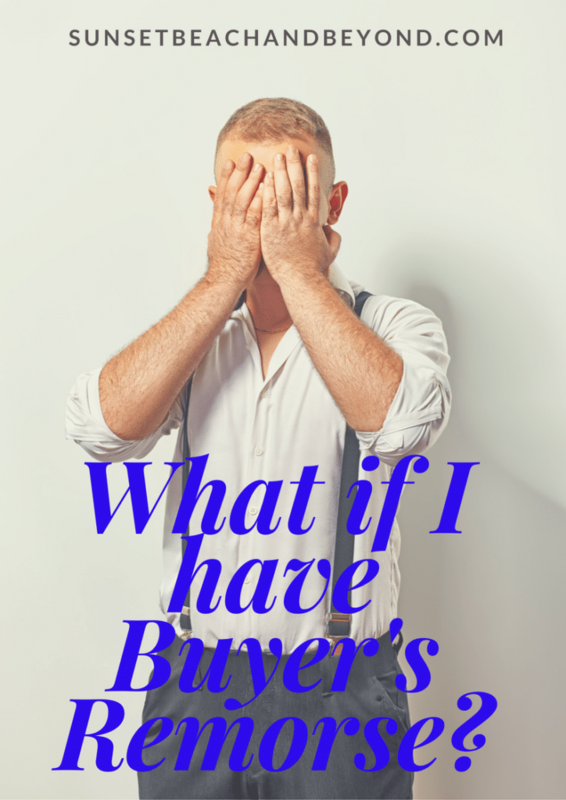 There may be nothing worse than having buyers remorse after spending several hundreds of thousands of dollars on a house, lot or condominium. That’s a huge chunk of change to be regretful over. And there are a lot of reasons that people might have buyers wars after finalizing the purchase of the property. Perhaps small repairs now seem overwhelming or maybe the commute is longer than expected. If this is the first house you’ve ever purchased it can be an adjustment for many people. You may have spent weeks or even months looking for the right house and finalizing all the financial details only to regret your purchase once you close. We’ve helped several homebuyers in different markets and sometimes, the pressure of just getting the house overwrites the realization that you may not get the right house. I’ve had buyers that want to keep going on a bidding war even though they may not really love the home. It’s the thrill of the chase and the competition that they like more than the actual house, which is a huge danger for the rest of the people that need to live in the house. We really try to emphasize finding the right house, not just winning the deal. Once you get in that house and the marriage really starts, you will start to notice things that you didn’t even think about before. But what happens if you really have buyers remorse? First of all, give it six months. You may find other things that will be more beneficial than the things that are really bothering you. Perhaps it’s a great community or good school district; maybe you love your neighbors and find new features about the house that make you fall in love with it even more. If the end of six months you still don’t love it, talk to your real estate agent about the options. It will depend on how much money you put down on the home versus the market, versus what is available out there and what it would take to sell and purchase a new home simultaneously. Now, in order to avoid buyers remorse, there are several things you can do ahead of time before that final closing. Consider a cancellation clause. In a hot seller’s market homeowners may not accept an offer that includes this but for most buyers markets, this is acceptable. It might not be commonly used but you can talk to your agent about this cancellation clause before signing an offer on a house. Know what you really want and stick to it. Don’t get caught up in a bidding war. If the home is really what you want and has every feature you are looking for, go ahead and fight for it. If you’re only fighting for the sake of winning, there’s usually a better house out there. Get on the same page with everybody that’s going to be living in the house. Does everybody love the house? Are there features that will appeal to everyone in the home? Do you understand the reality of things you might have to fix after you move in? I can’t tell you how many buyers think that they can do everything with the house once a move-in and chances are only about 10% of those things actually get done. Stop Looking at homes even though you have found one you really like. We are interesting creatures; given hundreds of choices we can’t seem to make a decision, but given just three or four, we fill a better sense of satisfaction on making the decision. Stop giving yourself so many choices and second-guessing your first decision. Often times one of the first couple of houses people look at are the ones that they go with, but they keep looking just to see if there’s anything better out there. Don’t get caught up in that cycle. Use a real estate agent that understands buyers remorse and any other issues that come up. The only way to do this is by using an experienced and seasoned real estate agent. Brand-new real estate agents have no idea all the nuances that come both before and after buying a home. Only a real estate agent that has been in the game for years can help you make a wise decision and help you make better-informed decisions throughout the process. Give us a call if you have buyers remorse on a home you’ve already purchased or if you’d really like a skilled agent to guide you through the home buying process. We work solely within the Brunswick County area including Sunset Beach and surrounding coastal towns. If you enjoyed this post you might like these! In a real estate transaction, there are typically two agents involved, the buyer’s agent and the listing agent. The listing agent is the agent that meets with the seller to list and market the property. This agent can also bring the buyer but more often than not buyers will have their own representative called a buyer’s agent. But, why wouldn’t the buyer just use the listing agent of the property they are interested in? When sellers list their property with the listing agent they negotiate on a commission that is typically split between the buyer’s agent and the listing agent. The listing agent, who might also bring the buyer, receives the full commission. So you can see that a listing agent certainly has an incentive to also find the buyer. But the sole goal for the listing agent is to sell that particular property because he/she represents the owner. A buyer’s agent has no ulterior agenda or motive for selling any one particular property. Their goal is to sell a property that is ideal for the buyer. 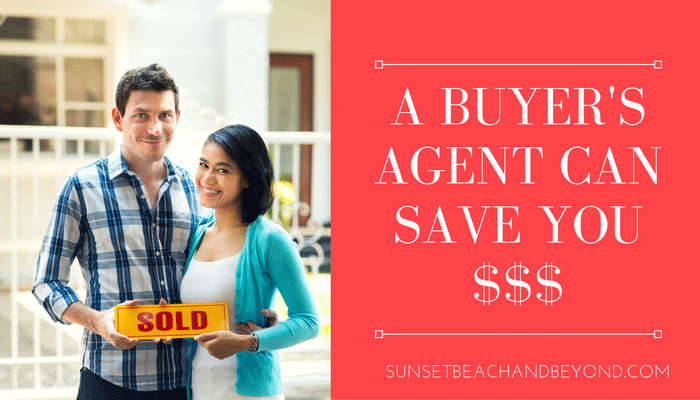 But how can a buyer’s agent save you money? A buyer’s agent keeps your financial situation and your negotiating strategies confidential. Their goal is to help you find the right property, not sell any one particular home. A buyer’s agent receives the split commission regardless of which home the buyer chooses so the ultimate goal is finding the right home for the buyer, not selling the home for a particular seller. Because of this, negotiating strategies and specifics of the terms can be kept confidential throughout negotiations. This can actually save buyers money by offering less than the listing price and since the seller and the listing agent are not aware of the buyer’s strategies, the transaction is more in favor of swinging towards the buyer’s terms. As a Sunset Beach real estate agent, it is my duty and my passion to make sure you find the right home at the right price. Your desires and needs become my goals as we work together side-by-side to purchase the correct property for your requirements. Remember, since the owner pays the real estate commissions, it costs you nothing to use my services to facilitate a real estate transaction on your behalf. Use my expertise, skills, training and knowledge to get the right home, in the right neighborhood, for the right price. Sunset Beach and the Brunswick Islands are a wonderful place to call home and whether you’re buying, selling, or investing in a home, condo, or any property in our area I would be happy to help facilitate the transaction and represent you on your behalf. Our specialty is beach homes and properties in the Brunswick Islands and because I know the area, the market, the communities and the people, I can make your home buying or selling experience a pleasant venture. Contact me today for more information on how we can get started.